At 167.3 kilometres, the route of stage 5 in the BinckBank Tour takes in two different laps to the south of Sittard/Geleen. The race is partly played out on the roads of the Amstel Gold Race, including the famous Cauberg. The riders are to crest 19 hills before arriving at the finish line, while a cobbled stretch of 200 metres at 10% marks the finale. Sittard/Geleen was a regular host of the Eneco Tour and continues to do so in the BinckBank Tour. Last year, BMC took the TTT in the place in the south of the Netherlands, while Johan Le Bon outsprinted Dylan van Baarle two years ago after being in the break together. In 2014, Guillaume Van Keirsbulck soloed to victory in Sittard/Geleen. The 5th stage of the BinckBank Tour takes in two loops to the south of the departure and arrival place. 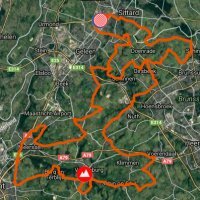 The first one amounts to 90 kilometres and runs partly on the route of the Amstel Gold Race. The riders are to crest Sibbergrubbe, Cauberg and Lange Raarberg – all climbs in the Dutch Spring Classic -, plus five more hills. After the first passage on the line the race concludes with two 38.8 kilometres laps, both with five short and sharp climbs. In order of appearance, Bergstraße (700 metres at 4%), Schatsberg (800 metres at 5%), Weg langs Stammen (350 metres at 8%), Windraak (700 metres at 4.5%) and Watersley (400 metres at 4%). In the last round these hills are crested with 31.3 kilometres, 16.6 kilometres, 12.3 kilometres, 7.8 kilometres and 6.4 kilometres remaining. With around 1 kilometre left the riders face a cobbled sectorof 200 metres with a 10% slope. The Golden Kilometre begins at kilometre 150.9, giving riders the opportunity take to three time bonuses of 3, 2 and 1 seconds each within 1 kilometre. The first three riders on the line win 10, 6 and 4 seconds. Read also: results/race report 5th stage 2017 BinckBank Tour.